DeAngelo was born with “Hydrocephelus” which is fluid on his brain. He can not walk and does not have a language, He eats by feeding kangaroo machine, and is wheelchair bound. And even with all of this, he is a blessing to the family. DeAngelo likes to watch cartoon DVD’s. He watches the ones that play for hours. He likes to play in his play pin with his soft teddy bears. He can not play with hard toys. 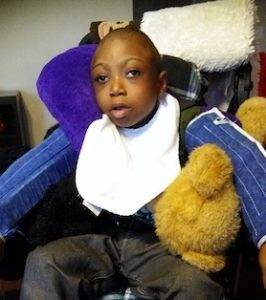 JEANS, JOGGING SUITS , LONG SLEEVE SHIRTS, T-SHIRTS, SOCKS – SIZE 8, OLD NAVY CLOTHES ARE FINE, HE IS ONLY 40 POUNDS. SO USE THE KIDS SECTION. Family needs would be gift cards for Kroger for food, and or gift cards for Walmart for households.